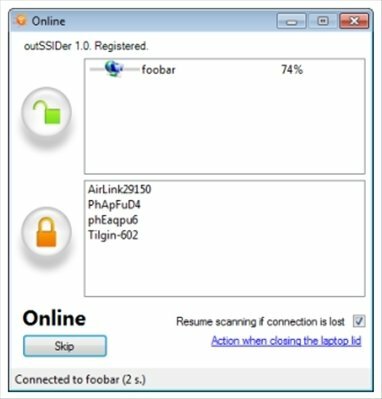 With outSSIDer you can connect automatically to the Wi-Fi networks that you find with your laptop. 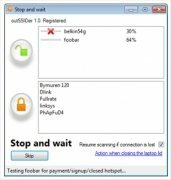 outSSIDer is a software tool conceived to be able to detect open access points in your range. 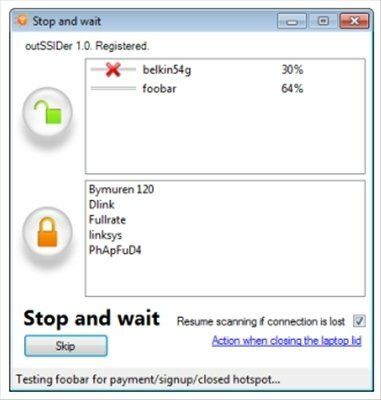 A sound signal will tell you to stop while it checks if the connection works. The perfect tool to go Wi-Fi hunting. outSSIDer finds out if the network is functional, loading the icon of Google's web. This is a way of avoiding private networks and paid access points. Regardless of whether the connection fails or it is proven to be functional, you will be notified with another signal. You won't even have to open your laptop's lid. View the Wi-Fi networks within your reach, signal intensity and encryption. Choose between several network devices. Establish a minimum signal intensity and a maximum amount of time to verify connections. 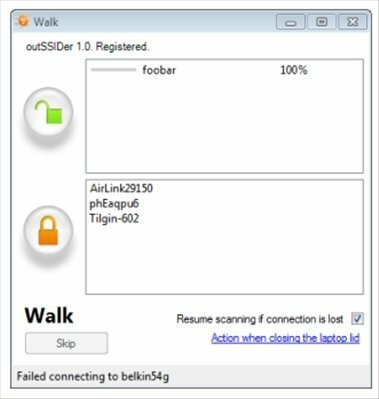 Install outSSIDer for free, take your laptop for a walk around town and let it discover all the Wi-Fi networks at your reach that you can connect to.